Optiwave Corporation's suite of design and simulation software maximizes the efficiency and effectiveness of our customer's optical networks, subsystems and components to help bring customer's vision to light. OptiSystem is a comprehensive software design suite that enables users to plan, test, and simulate optical links in the transmission layer of modern optical networks.In an industry where cost effectiveness and productivity are imperative for success, the award winning OptiSystem can minimize time requirements and decrease cost related to the design of optical systems,links, and components. OptiSystem is an innovative,rapidly evolving, and powerful software design tool that enables users to plan, test, and simulate almost every type of optical link in the transmission layer of a broad spectrum of optical networks from LAN, SAN, MAN to ultra-long-haul. It offers transmission layer optical communication system design and planning from component to system level, and visually presents analysis and scenarios. Its integration with other Optiwave products and design tools of industry leading electronic design automation software all contribute to OptiSystem speeding your product to market and reducing the payback period. The most comprehensive optical communication design suite for optical system design engineers is now even better with the release of OptiSystem version 10, available in 32-bit and TRUE 64-bit editions. 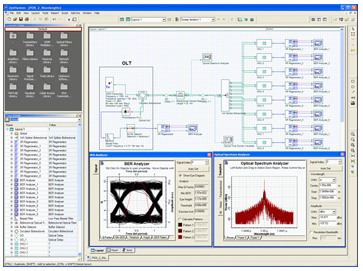 OptiSPICE is the first circuit design software for analysis of integrated circuits including interactions of optical and electronic components. It allows for the design and simulation of opto-electronic circuits at the transistor level, from laser drivers to transimpedance amplifiers, optical interconnects and electronic equalizers. OptiSPICE produces self-consistent solutions of opto-electronic circuits that contain feedback spanning both optical and electrical parts. OptiSPICE is a fully-integrated solution for parameter extraction, schematic capture, circuit simulation and waveform analysis. Significantly reduce product development costs and boost productivity through OptiSPICE comprehensive design environment to simulate optical and electrical circuits in one simulation engine. Run state-of-the-art transient time domain, small-signal frequency, and noise analysis to accurately predict behaviour of advanced opto-electronic circuits. OptiSPICE Schematics offers direct schematic entry in an intuitive graphical user interface. It allows for greater ease of schematic capture, parameter specification, waveform probing and usage. Waveform analysis using OptiSystem for complex post-processing functionality. Advanced visualization tools produce OSA Spectra, signal chirp, eye diagrams, polarization state, constellation diagrams and much more. Includes parameter extraction tools for OptiSPICE model creation. From measurement data, parameter extractors are used to find the best set of OptiSPICE model parameters to fit the measurement. 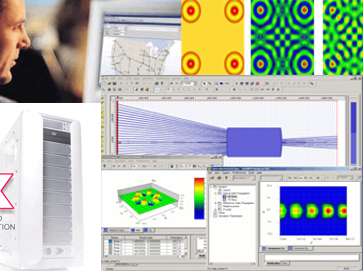 OptiFDTD enables you to design, analyze and test modern passive and nonlinear photonic components for wave propagation, scattering, reflection, diffraction, polarization and nonlinear phenomena. The core program of OptiFDTD is based on the Finite-Difference Time-Domain (FDTD) algorithm with second-order numerical accuracy and the most advanced boundary conditions - Uniaxial Perfectly Matched Layer (UPML). OptiBPM is a comprehensive CAD environment used for the design of complex optical waveguides. Perform guiding, coupling, switching, splitting, multiplexing, and demultiplexing of optical signals in photonic devices. OptiBPM can improve design engineers’ productivity, reduce risk, and lower overall costs related to design of waveguide solutions. OptiBPM’s high-value functionality includes powerful integration capabilities with our award-winning optical communication system software, OptiSystem, and with Design Workshop’s dw-2000, a mask layout physical design and verification software. Design optical splitters, combiners, couplers, multiplexers, and modulators. OptiGrating uses the Coupled Mode Theory to model the light and enable analysis and synthesis of gratings.A complex Grating is approximated by a sequence of uniform segments, and analyzed by connecting the segments with the well-known Transfer Matrix Method. This gives the designer the information needed to test and optimize grating designs. The optimal design of a given optical communication system depends directly on the choice of fiber parameters. OptiFiber uses numerical mode solvers and other models specialized to fibers for calculating dispersion, losses, birefringence, and PMD.Meshless Mode Solvers for LP and Vector Modes:Optical fibers may consist of an arbitrary number of concentric layers of lossless materials, and graded index fibers can be approximated using a sequence of constant index layers. OptiFiber 2.0 mode solvers find an exact solution based on matching boundary conditions at layer boundaries instead of relying on meshes to approximate the structure.These advanced mode solvers should be especially useful for multimode fiber calculations, where there are many modes in the spectrum.Another advantage of the meshless mode solver is the calculation of fields far from the fiber. Meshing introduces finite difference errors of a certain level, and fields weaker than the differencing error cannot be calculated. The meshless mode solvers, on the other hand, have the correct asymptotic behavior far from the fiber, and can calculate fields of magnitude 10-15 or less.This feature is in addition to the existing mode solvers in OptiFiber. We offers introductory courses for all products. Trainers, who are expert engineers, focus on your goals and how you can best utilize Optiwave tools to achieve them. Our two day short courses allow for a ‘hands on’ approach on learning how to use Optiwave tools to their best capabilities. OptiSYSTEM Fundamentals and Design Techniques. OptiFDTD Fundamentals and Design Techniques. OptiBPM Fundamentals and Design Techniques. OptiFiber & OptiGrating Fundamentals and Design Techniques.